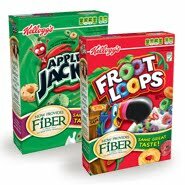 Kellogg's Apple Jacks and Froot Loops - Now With More Fiber? Fiber often equals "yech", so when we were told that fave cereals Apple Jacks and Froot Loops were now with more fiber (3 grams, to be exact) , I was a bit concerned it would affect the flavor. If you're looking for a way to "sneak" in more fiber without sounding like a nag, these improved cereals are a good way to go! "I wrote this review while participating in a blog tour campaign by Mom Central on behalf of Kellogg’s and received boxes of Froot Loops and Apple Jacks and a gift certificate to thank me for taking the time to participate."